OK, so you decided to plunge in and read some poems. What should you be looking for? Well, chill. I'm going to assume that if you're coming here to read this, you aren't writing professional criticism for a living. You don't need to know a metaphor from a simile, you just need to notice what's going on in the poem. Let me tell you about a very interesting museum my wife and I visited last spring. It was the National Civil Rights Museum in Memphis, TN. When we went in the ticket agent told us our ticket was good for two days, and we could come back tomorrow at no extra cost if we wanted to. I was surprised, because the building isn't that big. Well, let me tell you, each room had literally thousands of artifacts on the walls. It was difficult to focus on the room's story because it looked like someone had taken a time capsule and exploded the thing, sticking stuff everywhere. I quickly understood why it could take two days to visit this exhibit. But guess what? We didn't need to stop and read every poster, look at every photograph, or pay attention to each diorama. We were able to pick up on the spirit of the place and understand the story of the civil rights movement, even though we didn't notice every single thing there. When you read a poem, have the same attitude. Don't worry about missing some of the points. Poems often have multiple ideas going on at the same time, but you don't need to catch all of them to enjoy it. Think of all the movies you've ever enjoyed. Have you ever searched for information about one of those movies on line? You will find people obsessed with details, like why did the director choose a particular picture to be hanging on the wall in the restroom? Right, you didn't even notice that there was a picture hanging on the wall in the restroom, let alone that it was a particular painting by a particular artist. Still, you managed to enjoy the movie. Please, go read some poems! 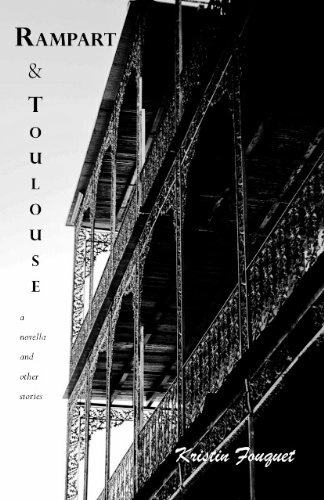 Kristin Fouquet's book, Rampart and Toulouse, has been selected by A.J. 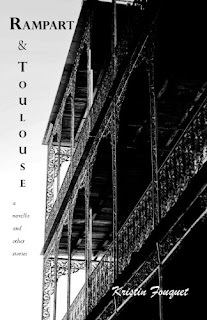 Hayes as one of 2011's novels you really should read. Mr. Hayes said that these books were the first five that poured into his head and also included Apostle Rising by Richard Godwin, All TheYoung Warriors by Anthony Neil Smith, Beautiful Naked And Dead/Out There Bad by Josh Stallings, and Convictions by Julie Morrigan. You can read his full article today at Guilty Conscience. Up until this point I've only used this blog to publicize work that I've had published. I would like to take a turn now and start sharing ideas about writing, and start sharing the work of others when I find it stimulating. Today I'd like to speak about reading poetry. So many people are convinced that they can't possibly understand poetry. It is true that often a poet is trying to communicate an idea, or even a feeling, that can't adequately be expressed in simple prose. When this is the case, trying to paraphrase a poem often strips all the magic out of it. You probably know Frances Mayes, although you may not recognize her name. She is the author of "Under the Tuscan Sun" a novel that was made into a movie some years back. Ms. Mayes was an English Professor at San Francisco State University and also wrote a book titled, The Discovery of Poetry. In her book we are told that Americans are '...overtrained to read for factual information." We are also described as overly pragmatic about our reading. According to Ms. Mayes we are also particularly time-conscious. She goes on to suggest that "The most important aspect of reading any poem is extensive reading - the more the better - of poems of all kinds, and the best reader is the one most open to the poem on the page." The next time you find a poem you might describe as obtuse, perhaps you could set it aside and come back to it when you have more time. Try to approach it as a puzzle, or a game, like a message sent to you in code, or maybe not necessarily in code, but using words that have a secondary meaning between you and the poet. Ignore the conventional denotations and concentrate on other possibilities. If there are words you don't know, do look them up. If there are phrases that sound familiar, do try them in a search engine. You may find that a familiar name is a character from a book, play or movie. You may find a line has been used as an allusion back to the work it originally came from, possibly even another well known poem. Don't be discouraged if the piece doesn't speak to you right away. If there is something about the poem that attracts you to it, come back to it again some time. Often our reading brings us to a key that's necessary to understand things we've read before but didn't understand fully at that time. Karl Gallagher has posted five of my previously unpublished poems and re-printed my recent interview with Catfish McDaris over at his Desolation Angels zine. (Also known as FitzroyDreaming) Karl hails from Australia, near Melbourne. Now I'd like you to go read my poems, but if you do, don't cheat yourself, scroll down a few articles and read an absolutely astonishing work by cowboy poet, Kell Robertson, called The Old Man Goes Home!!! It's worth the trip. Pablo D'Stair chose me to start his new series of conversations with poets at Blank Verse Dead. I have three poems featured in conjunction with this piece. A new poem, Industry, along with reprises of Note to a Shadow of My Former Self, and Interested Individuals Should Consider Just Giving Up.